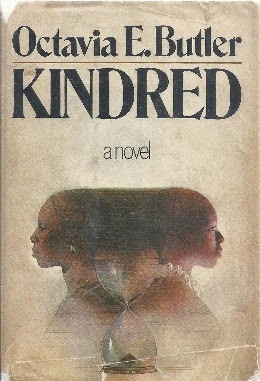 This is the cover of Butler’s most well-known novel Kindred (1979). It is the first hard cover edition published by Doubleday. Over time, the covers of Butler’s books have changed significantly. Deviating from imaginary sci-fi art to more modern realistic images that seem to capture her black heroines. This book cover stands out the most to me because of the black woman (could be Dana , the protagonist) who is divided against herself by time. The image on the left could be representative of her life in 1976, as the gold earrings seem to signal a privilege that was not given to slaves. The image on the right could highlight how she dressed when she travelled back to early 1800 antebellum Maryland. Another perspective could be that the woman on the right is Dana—the descendant of Rufus Weylin—a white man—and Alice Greenwood, a black slave. The two—Alice and Dana—could be only divided by the hourglass clock as they live in different time periods but are joined by their lineage and in respect to their white lovers. Dana’s husband is white, and Alice had two children with Rufus who initially raped her. The hourglass that separates the two images highlights the essence of time travel that operates without a magical time machine. The basic time stamp corresponds to the way that Butler does not use supernatural sways or capabilities to explain the importance of fleeting time and ancestral heritage.